Established in 1997, The Carrington Partnership is a privately owned, family run agency specialising exclusively in Lettings and Property Management and accredited by the National Approved Letting Scheme, The National Association of Estate Agents and The Property Ombudsman. Specialising in quality homes in key locations in South Manchester, properties range from studio apartments to large detached homes. The Carrington Partnership are regularly complimented on the excellent standard of the rented accommodation they offer. 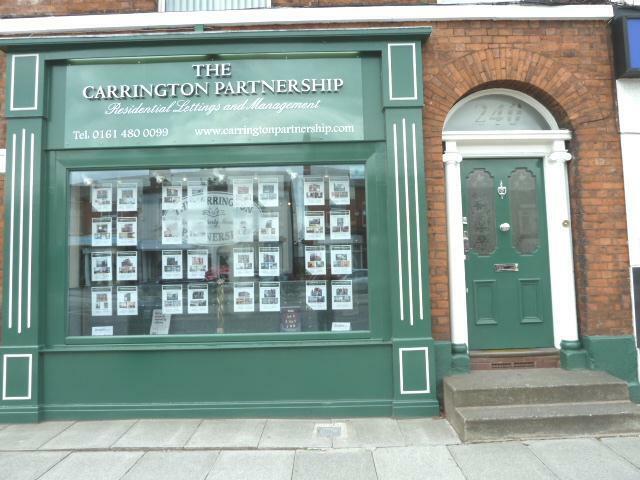 The Carrington Partnership are and always have been, solely letting specialists and their expertise has been used to assist clients with buy to let investments, acquisitions and refurbishment of properties for the lettings market. We charge a fixed fee per applicant which includes all admin, contracts, references etc. Deposit is constructed by the monthly rental amount with the additon of a further £100 and the first months rent is requested upfront prior the move in.